The Environmental Protection Agency's internal watchdog says White House officials pressured the agency to prematurely assure the public that the air was safe to breathe a week after the World Trade Center collapse. "Competing considerations, such as national security concerns and the desire to reopen Wall Street, also played a role in EPA's air quality statements," the report said. The New York Times, which reported on the inspector general's findings before they were made public, points out that officials from the EPA and from the White House criticized the report, saying investigators misunderstood the complexity of the situation after the terror attack. The agency's initial statements in the days following the Sept. 11, 2001 attacks were not supported by proper air quality monitoring data and analysis, EPA's inspector general, Nikki L. Tinsley, says in a 155-page report released late Thursday. An email sent just one day after the attacks, from then-EPA Deputy Administrator Linda Fisher's chief of staff to senior EPA officials, said "all statements to the media should be cleared" first by the National Security Council, the report says. Approval from the NSC, which is chaired by President Bush and serves as his main forum for discussing national security and foreign policy matters with his senior aides and Cabinet, was arranged through an official with the White House Council on Environmental Quality, the report said. That council, which coordinates federal environmental efforts, in turn "convinced EPA to add reassuring statements and delete cautionary ones," the inspector general found. For example, the report found, EPA was convinced to omit from its early public statements guidance for cleaning indoor spaces and tips on potential health effects from airborne dust containing asbestos, lead, glass fibers and concrete. James Connaughton, chairman of the White House Council on Environmental Quality, said in a telephone interview Friday that EPA did "an incredible job" with the World Trade Center cleanup. "The White House was involved in making sure that we were getting the most accurate information that was real, on a wide range of activities. That included the NSC — this was major terrorist incident," he said. The White House directed EPA to add and delete information, Connaughton said, based on whether it should be released through press statements, information on the Web or other means. "In the back and forth during that very intense period of time, we were making decisions about where the information should be released, what the best way to communicate the information was, so that people could respond responsibly and so that people had a good relative sense of potential risk," he said. The EPA inspector general recommends EPA adopt new procedures so its public statements on health risks and environmental quality are supported by data and analysis. Other recommendations include developing better indoor air cleanups and ways of handling asbestos in large-scale disasters. There is no evidence that airborne asbestos in the World Trade Center area posed a long-term health risk, but no study of the effects on the general public has actually been completed. A Mount Sinai study of rescue and recovery workers found that 78 percent had suffered lung ailments. The report notes that the agency's official position was that the levels of asbestos in outdoor air were safe for healthy adults, but that it lacked evidence about the potential health effects of indoor air and the risks of other contaminants or the effects on more vulnerable New Yorkers, including children and the elderly. The report notes that the agency's news releases did not mention these caveats and that "for the general public, EPA's overriding message was that there was no significant threat to human health." The report says an associate administrator considered adding to a news release information on the risks of exposure to fine dust particles for the more vulnerable segments of the population. But an official from the Council on Environmental Quality "discouraged her from doing so," the report says, arguing that information about health effects should not be in EPA news releases. The report compares two news releases with their draft versions and concludes, "Every change that was suggested by the CEQ contact was made." The Times' account of the report says that the title for the original version of one news release was, "EPA Initiating Emergency Response Activities, Testing Terrorized Sites For Environmental Hazards." In the final version, the second clause was changed to read, "Reassures Public About Environmental Hazards." 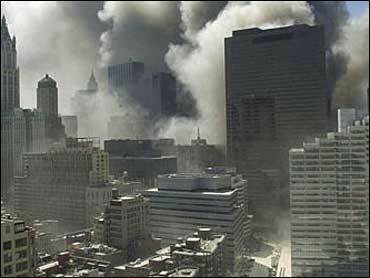 In the same release, a section that said, "Even at low levels, EPA considers asbestos hazardous in this situation" was deleted and replaced with a section that read, in part, "Short-term, low-level exposure of the type that might have been produced by the collapse of the World Trade Center buildings is unlikely to cause significant health effects."